OXFORD, Miss. 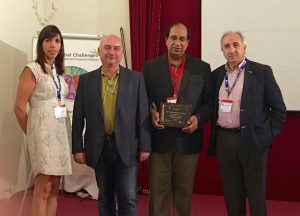 – Babu Tekwani, principal scientist in the University of Mississippi’s National Center for Natural Products Research and professor of pharmacology in the School of Pharmacy, was honored for his outstanding research contributions to global health drug discovery in tropical parasitic diseases at an international conference in León, Spain, on July 15. He received the Distinguished Scientist Award at the inaugural conference “Global Challenges in Neglected Tropical Diseases,” hosted by the Universidad de León and Fundación General Universidad de León y Empresa. Coordinators of the conference “Global Challenges In Neglected Tropical Diseases” in León, Spain, present Dr. Babu Tekwani (third from left) with the Distinguished Scientist Award. Tekwani has researched neglected tropical parasitic diseases such as malaria, leishmaniasis (an infection spread by sandflies) and human African trypanosomiasis (aka sleeping sickness) for more than 30 years. His work has identified potential new molecular targets and sources for anti-parasitic drugs that would help eradicate these diseases, and developed new ways to test the drugs’ efficacy. “With his outstanding research contributions on tropical parasitic diseases, Dr. Tekwani rightly deserves to achieve this recognition,” said Rafael Balaña-Fouce, professor of biomedical sciences at the University of León and organizer of the conference. Neglected tropical diseases are categorized as such if they disproportionately affect impoverished people and traditionally have not been the subject of much research. Tekwani’s work in this area previously has been recognized by the National Institutes of Health, World Health Organization and Council of Scientific and Industrial Research in India.